Young grizzly grazes on early summer growth in the Nekite River estuary in British Columbia. Mother polar bear with cubs in Canada's Churchill Wildlife Management Area. 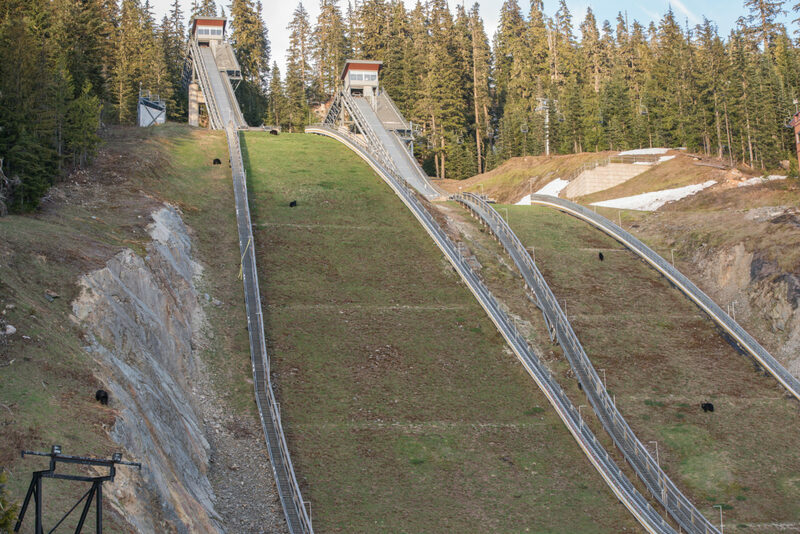 Whistler Olympic Park hosted several events during the 2010 Winter Olympics, with its stomach-churning ski jumps and 120 kilometres worth of backcountry trails. During the summer however, once the snow has melted and the extreme sports folk have packed their bags, the park sees black bears wander in and out of surrounding forests to feast on the fresh bounty of clover and berries that grow here (photo: Jason Heine). From ‘Tinder for bears’ to a family reunion, Alissa Jenkins sets out to see if Canada’s bears really deserve their menacing reputation. There’s a debate I often have with my Canadian friends; whose wildlife is more terrifying; Australia’s or Canada’s? While they’ll quiver about the venomous snakes and spiders that have been found lurking in shoes and beds, I’ll retort with some wise crack about slim chances and antivenom, yadda yadda yadda. An altercation with a bear however, is not so easily remedied. But do these great beasts, which have received their fair share of bad press over the years (thanks, The Revenant), really deserve such a menacing reputation? “There are thousands of untold stories of peaceful human-and-bear encounters every season, but bears have become demonised because of a handful of negative encounters that get media attention,” says Jason Coleman, an award-winning photographer and the lead guide behind Whistler Photo Safaris. “I used to do fashion photography and I can tell you, bears are less vicious,” he smiles wryly. 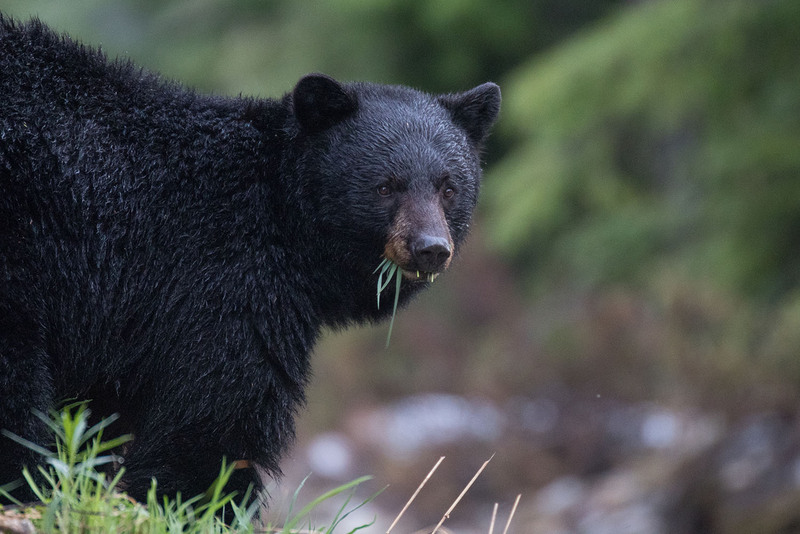 After a decade in the fashion game, Jason returned Whistler, British Columbia, to pursue his first love of wildlife photography, logging more time observing and recording local black bears in Whistler’s Callaghan Valley than, arguably, anyone else had. This unwavering interest spurred his bear-watching safaris around Whistler’s backcountry, which are now run by a fleet of guides skilled in various fields from photography and ecotourism, to geological engineering and veterinarian science. To prove his point, today we’re driving to Whistler Olympic Park as dawn breaks in hopes of seeing a couple of the 120-150,000 black bears thought to inhabit British Columbia’s alpine forests. Located a half-hour drive south-west of Whistler Village, the ski park hosted several events during the 2010 Winter Olympics, with its stomach-churning ski jumps and 120 kilometres worth of backcountry trails, but that’s not why we’re going. During the summer, once the snow has melted and the extreme sports folk have packed their bags, the park sees black bears wander in and out of surrounding forests to feast on the fresh bounty of clover and berries that grow here. As Jason explains, before black bears can return to their dens for hibernation, they must accrue a four-inch layer of fat to sustain them, which means consuming a hearty 10,000 calories a day. And no, their diet isn’t made up of unsuspecting humans, but predominately berries, grasses, nuts, and insects, making the park prime territory for a mid-summer’s feast. As we approach the park gates, we notice our first black bear chewing grass on the side of the road. With most of Whistler still asleep, Jason pulls over into a safe clearing where we watch it through the car windows. “This little guy is only a young male. He keeps looking that way, which I’m guessing is because he’s aware of another bear’s presence,” he whispers, signalling ahead. “Notice how his back is facing us? That’s his way of communicating he’s passive, he’s not interested in any confrontation.” We sit in silence until the bear is comfortable enough to amble around to face us, watchful of other potential threats. As Jason goes on to explain, one of the biggest threats facing black bears is humans being irresponsible, like getting too close to take photos, or luring them into campsites with food that hasn’t been stored properly. The reality is, if a bear is antagonised, if they’re caught off guard, or if their space is encroached (especially if cubs are around), the chances of them becoming defensive is greatly increased. Once that happens conservation authorities have to intervene, which can mean that these creatures, having been pushed into protection mode, are euthanised. After a few minutes, we decide to move on. Inside the ski park, the drive feels like a game of dodgem cars, as we bump and bound down dirt tracks (which in winter transform into snow-covered cross-country ski trails), carving through dense forest, inaccessible if not for our Jeep’s 4WD suspension. Suddenly, Jason hits the brakes. “See those claw marks? They’re new,” he quizzes, pointing to a tree trunk right beside the passenger seat window. A distinct set of stripes have been etched deep into the tree’s bark, a couple metres off the ground. “My guess is they belong to a big male because they’re quite high. This is how bears communicate with one another, by leaving claw and bite marks on trees to let each other know who’s around,” he explains, assuring it’s not an intimidation tactic to keep people inside their vehicles. “So, when a female comes past, she’ll know what potential mates are nearby. It’s like Tinder, she’ll have to swipe left or right,” he winks. His mobile beeps — it’s one of the other guides. They’ve spotted a mother bear with cubs nearby. The engine revs up and we again bounce off boulders and over potholes until arriving at a slither of trees and bushes, sandwiched between two roads. One of the other Jeeps is parked at the opposite end. The mother bear and her two cubs have since retreated into the shrubbery to, as Jason assumes, nurse. We wait for a few minutes but with no sign (or sound) of them crunching over twigs, we begin to drive off. Just as we round the corner to turn onto the upper road, there she is, munching her way through the tail-end of the treeline. Jason immediately stops the car and turns off the ignition. We sit in silence, awe-struck by this silky black creature moseying across the road before us, who could not care less about our presence. She’s on the other side of the road before we hear rustling in the bushes — her two tiny cubs are following, distracted by every branch, trunk and mound of grass to practise their wobbly scavenging skills on. “She gives them a particularly long leash,” notes Jason looking down a camera lens, observing the widening gap between Mum (now out of sight) and her curious cubs. Suddenly startled by her absence, they waddle across the road like two tiny wombats. By now Mum has wandered over 50 metres away in the opposite direction. Their soft, pudgy paws quicken, searching for her like kids lost at the supermarket. Drawn by their distress signals, she eventually returns to the intersection where, there in the middle of the road, the trio reunite. Ever so gently she presses her nose against theirs, consoling the twins before ushering them off the road and into the forest… this time they don’t stray so much as a metre. Such is the tenderness and vulnerability we’ve seen this morning, it’s hard to imagine these very same creatures actively seeking out a human to harm, much less pulling the trigger on one. Perhaps the most terrifying wildlife of all spans across both Canada and Australia… us. Often mistaken for being menacing carnivores, black bears are actually omnivores and meat is only a very small percentage of their diet. They’re generally shy creatures that will usually try to avoid humans unless surprised or have found food. When hiking, give black bears an opportunity to keep their distance by making your presence known with speaking, singing, and making noise. If you do come across a bear, stay calm and assess the situation. If the bear is a decent distance away, keep your space and make a generous detour around it. If it’s closer, speak in a calm voice, back away slowly, but never run. If you see a bear on the side of the road, obey all traffic laws and do not stop on the road — you can be fined. If you are in a safe pullout location, then be sure to stay back 100 metres. Always stay inside the vehicle. When camping, store your food properly and dispose of rubbish responsibly so as not to attract bears to the area. Carry a can of bear spray as a precaution. In the extreme unlikelihood that you are attacked by a black bear, fight back with any weapon you can find. Do NOT play dead. As the most widespread bear in Canada, black bears inhabit forests of every province and territory, with the exception of Prince Edward Island. The safest way to see one (for you, and the bear) is with a professional guide. 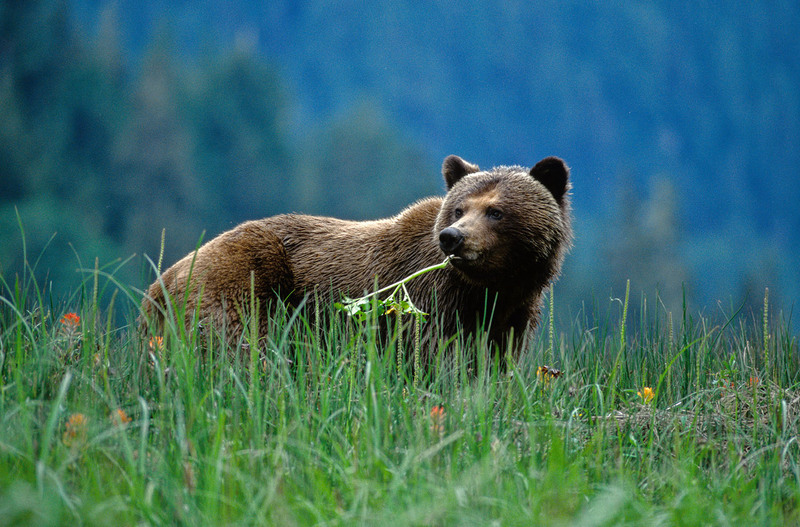 There are many reputable operators that offer ethical bear-watching experiences, including Whistler Photo Safaris. While grizzly bears are often portrayed as aggressive creatures that simply want to eat you, they too would rather avoid dangerous human interactions. Again, their reactions toward humans are largely dependent on if they’ve been caught by surprise or not. Avoid surprising a bear in the wild by making noise when you’re hiking, especially when you’re rounding corners, going through thick bush, or are near noisy areas like rivers. Don’t camp in the middle of prime habitat like next to a salmon river or in the middle of a berry patch. Travel in groups wherever possible. If you see one, stay calm and slowly walk away while facing the bear, without making direct eye contact. Never run, as that can encourage them to chase you. Despite common myths, grizzly bears actually run faster downhill than humans, AND they are excellent swimmers. If you see a bear from your car, stay inside the vehicle at all times. If you do get attacked by a mother grizzly protecting her cubs, and contact is made, play dead. Otherwise, in an offensive or predatory attack, fight for your life. The safest way to see a grizzly in the wild is with a tour company that is specialised in bear viewing, such as Great Bear Nature Tours on the central coast of British Columbia. Not only will they keep you safe, but they will usually work with populations of bears that are used to their presence and thus more relaxed (and photogenic). While polar bears have a deviant reputation for stalking humans, they’re actually no more likely to actively hunt people than the common black bear. Do not travel in polar bear country on foot, skis, or snow machine without having personal protection such as bear spray. If you do encounter a polar bear, stay calm, do not turn your back and do not run — you can’t out-sprint a polar bear. If in a group, stay together. Back away slowly into a safe space, like a vehicle or building. Discard of anything smelly or potentially tasty for a bear. The best way to see a polar bear in Canada is with a professional operator, like Frontiers North Adventures, running polar bear viewing excursions in Churchill, Manitoba. 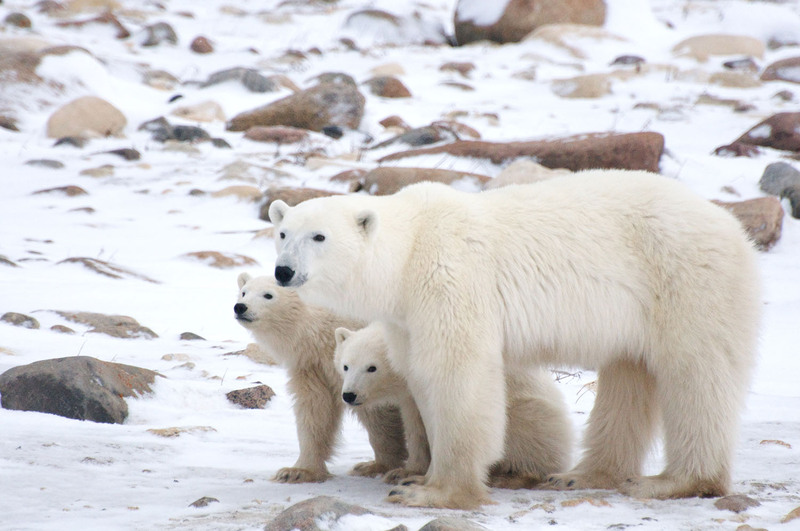 Delving into the Churchill Wildlife Management Area, these tours follow the migratory path of one of the most accessible populations of polar bears in the world. Equipped with a specially designed Tundra Buggy, passengers are kept at a safe distance (and height) from these majestic creatures. Prime viewing is between October and November.